Question: Who first started the Sri Gaudiya Darshan magazine and why? Srila Govinda Maharaj: In the time of Prabhupad Srila Bhakti Siddhanta Saraswati Thakur, Srila Guru Maharaj preached all over India. He was a very successful preacher and everyone respected him. By the wish of Krishna when Srila Guru Maharaj came out from the Gaudiya Math many of the senior devotees also came out at that time and they started to preach. Srila Guru Maharaj did not join with them but he helped them. In particular he helped his godbrothers such as Sripad Jajavar Maharaj, Sripad Goswami Maharaj, and Sripad Keshav Maharaj, but finally it was his wish to stay alone in this Sri Chaitanya Saraswat Math. There is no doubt that his wish was always for preaching. He was always preaching Sriman Mahaprabhu’s glories and Srila Bhakti Siddhanta Saraswati Thakur’s glories, and everyone would come to hear from him and receive inspiration. They felt that it was Srila Prabhupad himself explaining to them about Krishna consciousness. When Srila Guru Maharaj started his preaching in Sri Chaitanya Saraswat Math he lived in a hut. It was then his intention that he would preach to those who came to him, but he would no longer go out from the math to preach. At that time Srila Guru Maharaj showed us that his health was not so suitable for preaching. But his wish to preach was very strong. Srila Guru Maharaj received some inspiration that it was the desire of Prabhupad Srila Bhakti Siddhanta Saraswati Thakur and Sriman Mahaprabhu that this sampraday would run through him. Many of the disciples of Srila Saraswati Thakur continued their preaching, but mostly it was the earnest desire of Srila Saraswati Thakur that the preceptorial line will run through our Srila Guru Maharaj. Srila Guru Maharaj also was looking for someone to continue that line. When Srila Guru Maharaj gave me the chance to stay at his lotus feet he received some inspiration: “Perhaps this boy can continue the preceptorial line.” He therefore gave some nourishment to me. I was not so qualified. Actually I was unqualified, but he tried to make me qualified. Guru Maharaj with this proposal. Srila Guru Maharaj was very enthusiastic and I requested that he give an article each month. Also I approached Sripad Madhusudan Maharaj, Sripad Jajavar Maharaj, and others who were capable to contribute articles. At least in every issue one article must be Srila Guru Maharaj’s article, and one I can collect from Srila Saraswati Thakur’s writings. And if Sripad Madhusudan Maharaj will give one article, then I will get at least three strong articles each month, and in this way the dignity of the paper must be higher than others’ magazines. Srila Guru Maharaj was very enthusiastic and said, “This idea is very good. If you can continue, then try to do this.” I then began. It is the teaching of Srila Guru Maharaj that we shall proceed under the guidance of Sri Guru-Vaishnav, and it is my nature that I always keep the Vaishnavs upon my head. In that way I considered Sripad Madhusudan Maharaj to be highly qualified, and if he would take the editor’s position our magazine would receive universal appreciation. That is, we are living in Sri Chaitanya Saraswat Math, and this magazine is for Sri Chaitanya Saraswat Math, but our editor is from another math. Thus everyone can see that our vision is that we are giving position to those who are really qualified. They will see that we have a broad view. Not only that, but we decided that we shall glorify other Vaishnavs’ characters, and give news of other Vaishnavs’ preaching also. We did that, furthermore we published their activities with pictures. We tried to glorify the mission and character of all the godbrothers who were very affectionately connected with Srila Guru Maharaj. In that way our Sri Gaudiya Darshan had a broad ‘international’ vision. Srila Guru Maharaj agreed and said to me, “If Sripad Madhusudan Maharaj will accept the position of editor it will be very good, but you must put your name there as joint editor.” Therefore Sripad Madhusudan Maharaj and myself were joint editors, Srila Guru Maharaj was the Founder-Acharya, and Sripad Jajavar Maharaj and Sripad Paramahamsa Maharaj were advisers of the Sri Gaudiya Darshan. 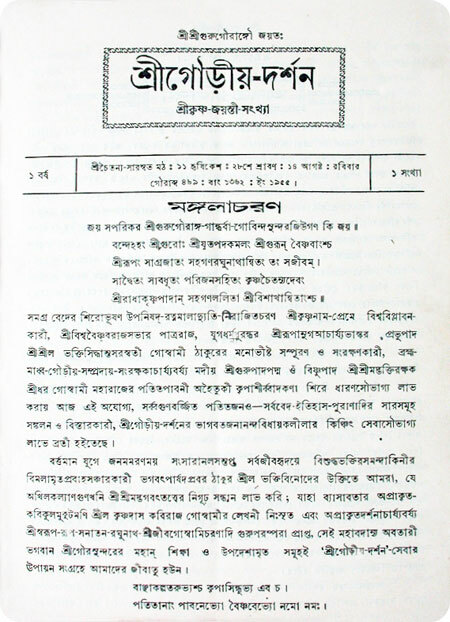 Srila Guru Maharaj as far as possible gave an article each month. Sripad Madhusudan Maharaj, Sripad Paramahamsa Maharaj, and others also gave. Sri Gaudiya Darshan began as a monthly magazine. For the first few years the magazine was very strong and ran well, but lastly all the burden for the running of Sri Chaitanya Saraswat Math came upon my head. I was practically alone and my time was very short, therefore the magazine became a little weaker later. Also Srila Guru Maharaj showed his health to be less strong and it was very difficult for him to give articles regularly. But we tried to continue. We always held a very neutral position. In the Sri Gaudiya Darshan, glorification to others connected throughout the whole sampraday was given where it was warranted, also guidelines were given when required. Everyone knew Srila Guru Maharaj was their guide and they accepted his advice. In this way Sri Gaudiya Darshan gained a high reputation. All the articles were either in Bengali or Sanskrit. Srila Guru Maharaj sometimes composed in Sanskrit, and especially at the beginning of each new year Srila Guru Maharaj would generally compose some Sanskrit shlokas. Also I must name one good compositor, Khapanaka Prabhu, who helped untiringly for hand-setting the type of the magazine. He was a disciple of Sripad Keshav Maharaj but with Sripad Keshav Maharaj’s permission he was living with us. Then, like now, many devotees from other maths would come and stay with us from time to time. They were disciples of other Maharajs but they would come in order to serve Srila Guru Maharaj. At first we printed the magazine from an outside commercial press, but after some time I felt the necessity to print from our own press. We then acquired a press and began publishing from it. It was larger than the machine we have here today. Khapanaka Prabhu finally took charge of our printing press. He greatly helped with the Sri Gaudiya Darshan, but gradually I became exhausted and actually it was not possible to continue. I wrote most of the articles but put the author’s name as Hari Charan Prabhu, Krishna Sharan Prabhu, Krishna Mayi Didi, Shankari D.D., etc. Sometimes they would write an article but mostly I wrote the articles in theirs and others’ names, and I became exhausted. After fourteen years of monthly printing we then printed it quarterly, and Khapanaka Prabhu helped then also. We did not stop printing altogether. We printed it as a quarterly publication for a further three years, then finally we printed each year one or two special issues as souvenir editions such as for Srila Guru Maharaj’s Vyas-puja and for Sri Gaura-purnima. Question: So, in recent years the Sri Gaudiya Darshan has been continuing as an occasional publication, but now you wish to have it restarted as a regular periodical. Please tell us why you want it restarted, and what articles you wish to be included? Srila Govinda Maharaj: Actually we never completely stopped printing the Sri Gaudiya Darshan. It was printed occasionally and we have much regard for this title Sri Gaudiya Darshan as the paper of Sri Chaitanya Saraswat Math. It is like our flag, therefore we cannot stop publishing it. It is alive. You will see that always we have tried to focus on some new light of Srila Guru Maharaj’s conception. In the previous issues, as much as possible we have done in this way. Within the last twelve years many books have been published for our math in English, Bengali, and many other languages, and there also the devotees can see Srila Guru Maharaj’s conception. There is much to read in these books. Now in particular my wish for this Sri Gaudiya Darshan is to present topical subjects and news of all the devotees’ activities here and abroad. For a long time our preaching has been international. After Srila Swami Maharaj returned from his successful preaching in the West, Srila Guru Maharaj became very happy and enthusiastic and he gave much respect to Srila Swami Maharaj. In Sri Chaitanya Saraswat Math every day Srila Guru Maharaj preached, but he did not go out from the math except perhaps three or four times yearly. He would go out on special occasions such as to Sripad Madhav Maharaj’s math in Calcutta where yearly they would hold one or two large week-long meetings. Sripad Madhav Maharaj would eagerly await Srila Guru Maharaj’s presence at such meetings. Srila Guru Maharaj would go there every year. In addition Srila Guru Maharaj would go to the appearance day meeting of Sripad Goswami Maharaj at Sri Gaudiya Sangha, 23 Doctor’s Lane, Calcutta. Mainly it was only to Sripad Madhav Maharaj’s math and Sripad Goswami Maharaj’s math that Srila Guru Maharaj would go to for preaching, but always he preached from his room upstairs in Sri Chaitanya Saraswat Math. Srila Guru Maharaj was a very enthusiastic preacher and many devotees had the opportunity to see how enthusiastic he was. Up until 1987 Srila Guru Maharaj continuously preached here, and his preaching continued, though not as fully as before, until a few months before his disappearance in August 1988. Actually during the whole day Srila Guru Maharaj would preach, but seated at one time he would often preach for two or three hours. The preaching tendency of Srila Guru Maharaj was of a very unique type. In March 1986 during his lifetime Srila Guru Maharaj gave me the full charge of this math as acharya, and we continued to produce publications. From abroad we also received publications for our math such as those from Sripad Bhakti Sudhir Goswami Maharaj and others. We continued to publish Sri Gaudiya Darshan at least yearly, and after Srila Guru Maharaj’s disappearance regular periodicals began from several of our branch missions including London, South Africa, Australia, and America. I was very enthusiastic to see the arrival of all these English magazines. We are disciples of Srila Guru Maharaj therefore we are very much enthusiastic to publish books and magazines in order to preach his message and glories. You can see that our preaching tendency is continuously proceeding, so when from the Western world five or six periodicals became manifest, naturally our feelings came that why is this not also possible from Sri Chaitanya Saraswat Math? The only cause was a lack of manpower. But if we can publish, then the mission all over the world will receive some guidelines. Sri Chaitanya Saraswat Math is the parent math of all the maths in our society, and for their guideline it is very good if again we can publish regularly the Sri Gaudiya Darshan. This is what is in the heart of us all here. We are all enthusiastic to again publish Sri Gaudiya Darshan because it will be in honour of Srila Guru Maharaj so automatically remembrance of Srila Guru Maharaj will come. In particular it is my intention that Sri Gaudiya Darshan will be a vehicle to keep devotees around the world connected together. They will get to know what each other are doing and especially they will hear from this central math, the central source of guidance of Srila Guru Maharaj for us all. This is one form of association for the devotees through which everyone everywhere may feel some energy and enthusiasm in their spiritual service-journey to their transcendental destination. It is very good if we can make this magazine, but I am getting older day by day therefore a new generation must take charge. If it is possible to make this periodical it must give pleasure to the heart of Srila Guru Maharaj and I must be very happy. If this Sri Gaudiya Darshan will come out in the Bengali language it will especially give nourishment to the Bengali section of devotees, and this is my eager desire. In English it is very good, and it will be more widespread if we can publish it in Bengali also, so our local devotees will gain more nourishment. At first Sri Gaudiya Darshan was in the Bengali language, and at that time I did not know English. Question: Do you have any message for the devotees? Srila Govinda Maharaj: Always we are messengers of Srila Guru Maharaj and Mahaprabhu. Our message is one always: practise Krishna consciousness without offence to Guru and Vaishnav. This is from Padma-purana and it gives one ruling and one prohibition: always remember the Lord, and never forget Him. All rules and regulations are under this guideline. If I see anyone doing even a little seva, my feelings towards him come as though I am a slave of him. That is my feeling. But in my life I have also seen many wrong things, therefore I am also a little cautious. I have been cheated in many ways, but my nature is still that if anyone will do even a little seva, I give my full support to him. In that way I am always trying to continue my seva. Where there is no life, there is no seva; that is ‘dead seva.’ It is karma. It is not for our fame that we are trying to publish Sri Gaudiya Darshan. Our intention is that this Sri Gaudiya Darshan will give happiness to our Sri Guru-varga as well as nourishment to the newcomers and other Vaishnavs. When a mission is big a periodical newsletter is necessary from the headquarters of the mission, but I cannot do everything alone, also I am getting old. I cannot promise, but anyhow I shall try to give one article for each edition. So, this is really a good attempt to do good for others through this magazine. Sri Gaudiya Darshan is blessed by Srila Guru Maharaj and blessed by all other exalted devotees like Srila Swami Maharaj. You have seen his letter expressing how much he was very pleased with me to see Sri Gaudiya Darshan. Also Sripad Sakhi Charan Ray Bhakti Vijay Prabhu, one of the best devotees of Srila Saraswati Thakur, was very pleased and sent a letter expressing this. Letters came from every corner but it was perhaps my fault that I did not publish them all in Sri Gaudiya Darshan. In one way it was necessary to publish all the letters that were giving praise to the magazine, but if I felt there was any praise to myself I did not publish such material, but where there was praise to Srila Guru Maharaj, I published that. From so many quarters, many praised me: “Oh, now Govinda Maharaj is doing this: Govinda Maharaj has started Sri Gaudiya Darshan.” But it was impossible by me to publish that. With what we have, we shall continue happily, and with this Sri Gaudiya Darshan it is my hope that really we can succeed in giving happiness to Srila Guru Maharaj and our Sri Guru-varga as well as nourishment to the newcomers and other Vaishnavs. By the cooperation of all the devotees, I think it must be possible.